Kobe Bryant & His Family Cheer On Team America! Home » Kobe Bryant & His Family Cheer On Team America! 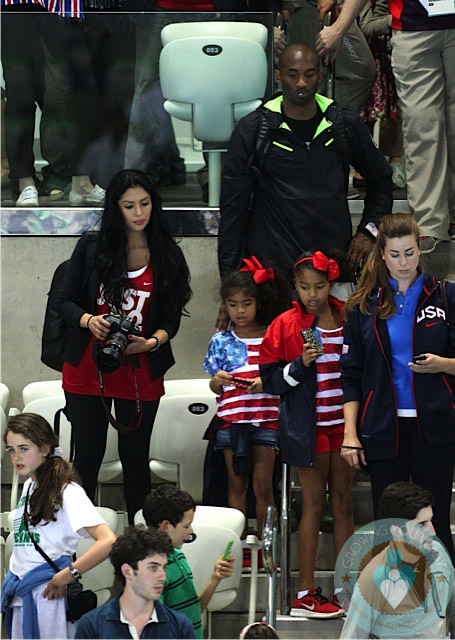 NBA star Kobe Bryant was spotted at the Aquatics Centre with his wife Vanessa and daughters Natalia and Gianna watching swimmer Michael Phelps swim the 100m Butterfly Final at the London 2012 Olympic Games. A member of team America, the Basketball player has been in attendance at quite a few events over the last week showing support for his fellow teammates. Natalia and Gianna cheered from the stands while dressed in red, white and blue from head to toe, including Nike, their dad’s lead sponsor. After winning over Lithuania on Saturday, Kobe and his team will come up against Argentina on Monday. Let’s see if they can prove why they are called the dream team. Eric Dane & Rebecca Gayheart Step Out With Their Girls in LA!